Have you ever sat down to play Arkanoid, Breakout, or a similar game and thought: “What this game needs is plot; a sense of adventure. I need a reason to hit a ball with a paddle and break things”? Neither have I, but for anyone that has, or is just curious to try a different take on the classic genre, Devilish is a thing that exists. 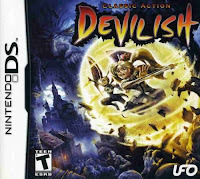 Released in 2006, Devilish, like many early DS releases, is a revitalization of an older series, and can be found on the Sega Game Gear and Genesis. 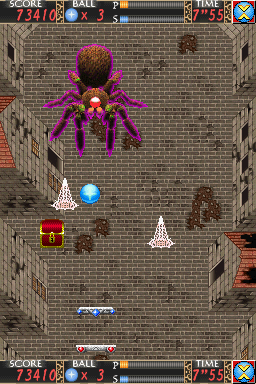 In contrast to something like Arkanoid with fixed-screen levels, Devilish features sixteen levels spread across five worlds which require players to navigate maze-like corridors, break down walls, defeat monsters, and collect powerups with the goal of finding the warp at the end within the time limit. For veteran brick breakers, the first two or three worlds will be a cakewalk, and as the motivation to continue comes into question, remember that Satan needs to be defeated in order to reclaim the kingdom... or something like that. There are a few lines of unmemorable story to read between each world, none of which really matters and is very ignorable, but upon setting paddle into world four, I found a new motivation: pure rage. Devilish has not one, but two paddles. The top one can be moved in all directions, and the bottom follows along the X axis. Despite being able to move the top paddle freely and having eight directions of rotation, once the ball picks up speed it becomes frustratingly stubborn and pretty much goes where it pleases. I found myself really only using the forward-facing flat position and the left and right 45 degree positions. In fact, I cleared the majority of some levels without even touching the d-pad. The ball would repeatedly bounce off a wall, hit the paddle, bounce off at a 90 degree angle, hit a wall, bounce back, and so on. Whenever I stumbled upon one of these sweet combinations, I didn't touch the paddle unless it was completely necessary. 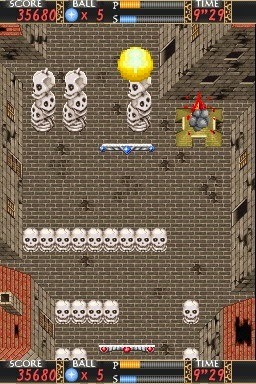 There's nothing like spending ¾ of your time trying to pass a single obstacle and then with less than thirty seconds on the clock, the sacred combination manifests, taking the ball through the rest of the level in a matter of seconds. Counter-intuitively, each world's boss battle is actually a reprieve from the rest of the game and are ridiculously easy to defeat. They're all fought on a fixed screen, so there's not much difficulty in keeping the ball in play, even while they're actively trying to throw it off course. I was a little disappointed that none of the bosses or enemies affected the paddle directly, either by temporarily stunning it, spinning it around, or something along those lines. Instead, they hurl debuffs, which among other things detract time, shrink the paddle, or speed the ball up. Powerups can be found in chests to counteract these, which slow down the ball, increase its damage, or turn it into a rocket able to tear through multiple layers of obstacles, to name a few. Devilish can be completed in little more than an hour, and while it isn't as solid as some of the other brick-breakers, I found it unique enough to be worth a shot, and for only a few bucks, I wasn't disappointed.